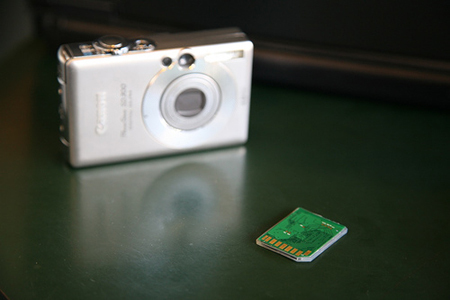 EyeFi, WiFi Enabled SD Cards | OhGizmo! Well, with the Eye Fi, you can take your current camera, and outfit it with a WiFi-enabled SD card. Then, the possibilities are really quite vast. You wouldn’t be limited to uploading pictures at home. Rather, anytime you’re within a hotspot, you could upload all your pics to Flickr at the press of a button. In that sense, the size of the SD card wouldn’t matter as much, because it would serve as something of a cache. The product is not being commercialized just yet, though development is well underway thanks to some angel funding, and the company is seeking more funding as production gets underway. Robert Scoble gave them a visit recently, and seems rather excited about the product. The price? Not much more than current SD cards. And they’ll hopefully be available this year.